Linda and I started getting to know each other during the summer of 1990. We met through a climbing club, the Chemeketans, in Salem, Oregon. That summer we started climbing together, both on rock crags and mountains. 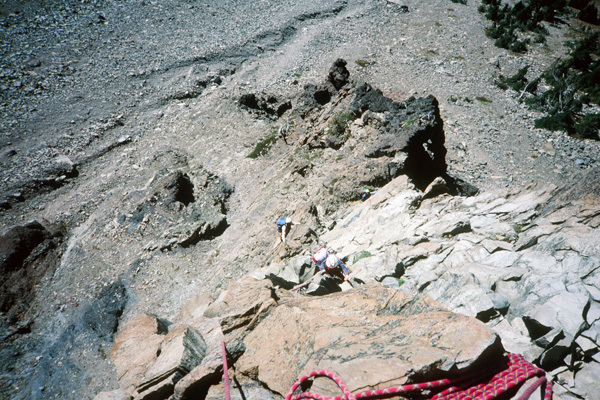 Here are two of many climbs I shared with Linda that summer. On October 20 Linda and I climbed “Moscow”, a three-pitch 5.6 route on the “Red Wall” at Smith Rock State Park in Central Oregon. 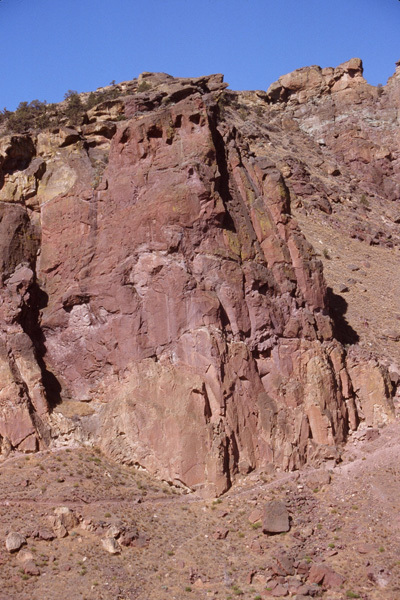 The Red Wall is a wall of volcanic tuff with several classic routes on excellent rock. The Moscow route is on the right side in the above view where a crack leads up along an obvious “dihedral” with a left-facing wall. The descent is typically down the Misery Ridge Trail on the slopes to the right. Moscow was my first multi-pitch rock climbing experience years earlier. Each “pitch” involves someone leading a section of the route on belay from below and creating a belay anchor at the top of the section. The leader then belays the “second” up to the top of the section from above. So Moscow involved three of these stages. The rock on Moscow is very stable and a wide crack provides a good place find hand holds and place your right foot. Sometimes I have struggled to unjam my foot in that crack. 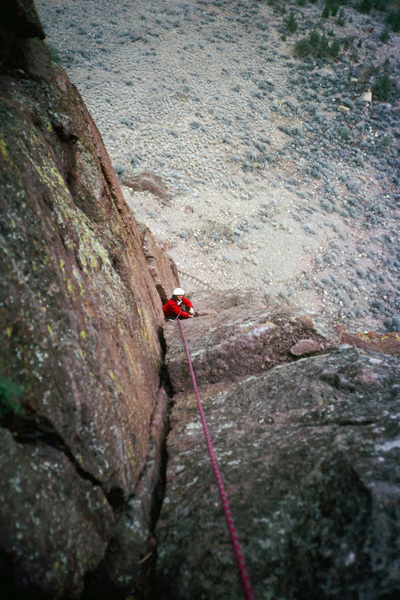 The experience of continuing a rock climb beyond the first pitch, belaying the lead climber from below while feeling the exposure of being anchored high above the ground was a memorable one for me years earlier. I thought Linda would enjoy it, and I think she did. At least she kept climbing with me. 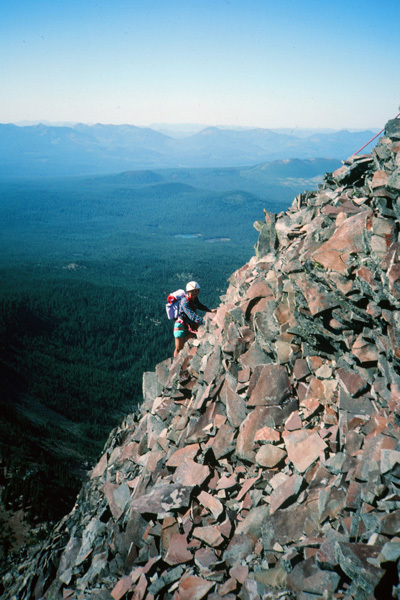 On September 22 Linda and I joined two of our friends, Tom and Roy, to climb the West Ridge of Mount Washington, a steep craggy peak near Santiam Pass in Oregon. 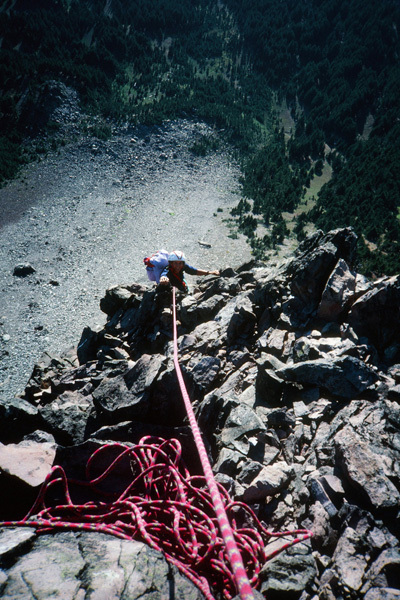 The usual route on Mount Washington is up the North Ridge, requiring a single pitch of maybe 5.2 difficulty, then exposed scrambling to the summit. I took the above photo in July 1979 while descending off Mount Washington with my brother Bob after our first climb of Mount Washington. We took the North Ridge route which is the ridge rising on the left side of the upper mountain. The West Ridge route is the long ridge rising on the right side in this view. 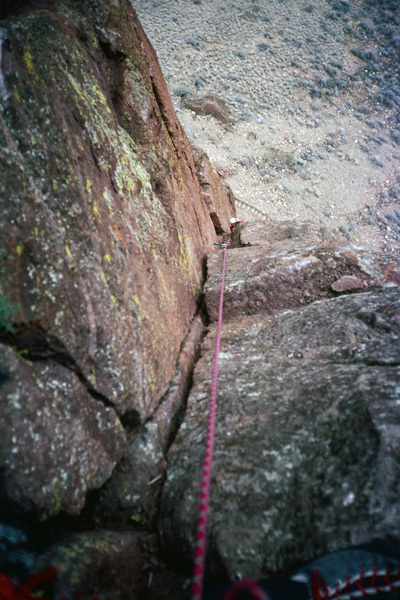 The West Ridge route requires multiple pitches of climbing and was rated at about 5.5 difficulty. 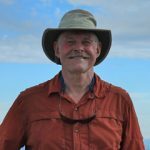 The West Ridge starts on steep ground, then becomes less steep but looser, then finally finishes with steep and fun climbing on firm rock. In the above view Linda follows me up the second pitch of the West Ridge. Our friends Tom and Roy are following us as a separate rope team. The middle section involved climbing up lower angle stacked piles of “Cascade dinnerplates”, piles of flat volcanic rock that were thankfully stable enough to climb. Here Linda is on belay. I must have found a decent belay anchor at the top of the dinnerplates. Where the climbing was steeper the rock was more stable. 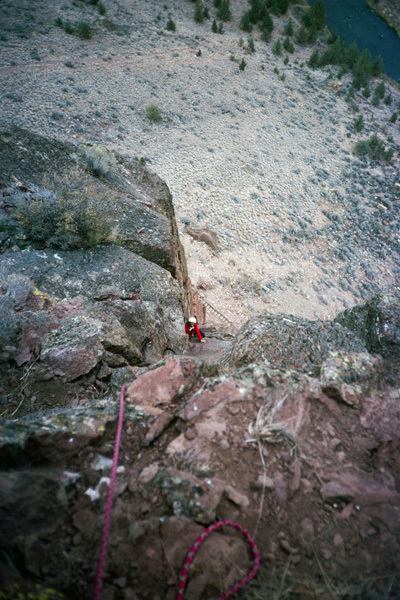 The 5.5 difficulty route is not obvious and it is easy to get off route and find oneself on harder climbing. Some dangling webbing loops can tempt one off route, but they might be emergency rappel stations for those who had gotten stuck. If a route choice looked harder than 5.5 then I did not take that option. The last pitch to the summit ridge was so scenic and fun! Here Linda tops out on the West Ridge onto the summit ridge. 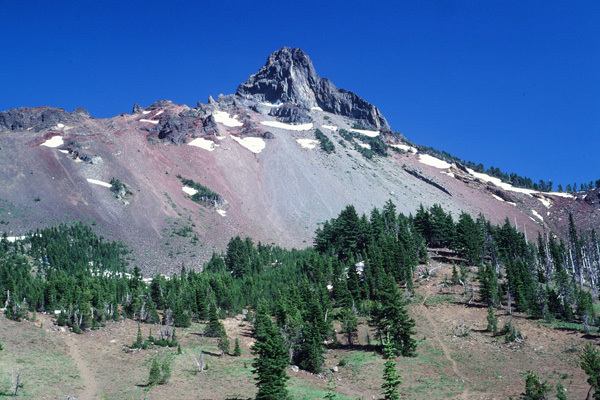 The talus slopes lie at least 1400 feet below. After summitting we descended the North Ridge. Linda greatly enjoyed this route and we repeated it a year later. 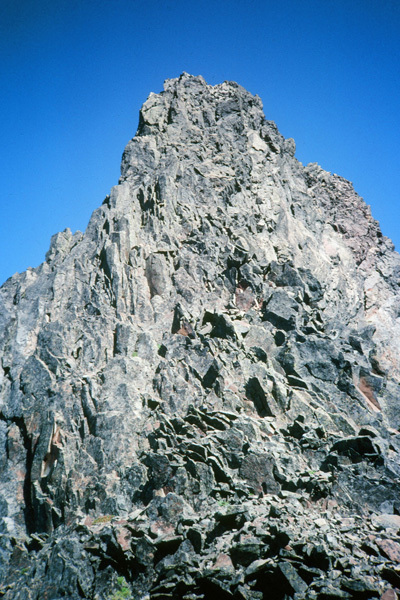 This entry was posted in Climbing, Family and tagged Mount Washington, Oregon Cascades, Rock Climbing, Smith Rock State Park. Bookmark the permalink.